Côtes-d'Armor is a department found in the west of France. Its prefecture is Saint-Brieuc and its population is about 561,000 (2006 estimation[update]). It is one of the 83 first French departments made during the French revolution. 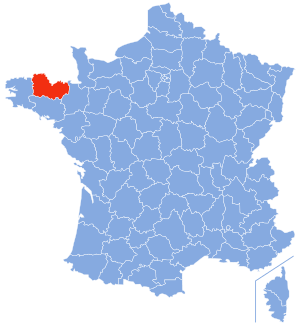 Côtes-d'Armor has also 3 subprefectures: Dinan, Guingamp and Lannion. Côtes-d'Armor Facts for Kids. Kiddle Encyclopedia.